TriMet is appealing to the community to help catch the man who stabbed our bus operator, Brian Nixon. TriMet is offering a $1,000 reward for information that leads to the arrest and conviction of the suspect who attacked Nixon on Saturday, April 20 and stabbed him in the leg. The attack happened outside a portable restroom at a Line 19 layover at Southeast 92nd and Flavel Street. Nixon remains on leave covering from his injury. 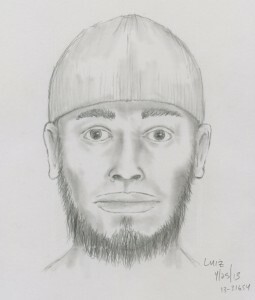 Portland Police released a composite of the suspect on May 1. Police typically do not recommend offering a reward immediately following an incident when there are leads to track down. But with those leads now running out, the lead officer in the case is now welcoming a reward from TriMet. Based on that direction, TriMet is now reissuing the composite and adding the $1,000 reward to prompt the public to assist in the apprehension of the suspect. TriMet’s Fiscal Year 2014, budget just adopted by the TriMet Board of Directors last week, includes $1.2 million for improvements to seven high-priority restroom locations for operators, including the layover at 92nd and Flavel. The agency has an ongoing program to fix areas of concern, but with the recent stabbing TriMet General Manager Neil McFarlane has re-prioritized capital expenditures to accelerate the program, addressing these safety concerns. Anyone with information should contact Detective Jonathan Hunt at (503) 823-0400 or Jonathan.Hunt@PortlandOregon.gov, or by calling TriMet customer service at 503-238-RIDE.